3. Go to "Building a Pipeline". Go through the 12 steps. 4. View "Highway to Hell" video. 5. Go to Google Maps and look at the geography (landforms) and the proposed pipeline. 6. In your notebook, write a reflection on #2-5. B. Lesson 1 Homework: Identifying Environmental Concerns. 7. Go to “Kitimat: Perils Threatening the Northern Gateway Pipeline.” Read the introduction and then scroll down to the map. Read pages 1 Then fill in the chart on your map labelled “Perils,” explaining each concern (starting with page 1: "Getting to Kitimat.") Create an icon for each of the concerns/perils and locate these icons on your map. 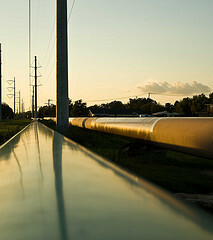 Finish reading “The Northern Gateway Pipeline” article from beginning to end. Identify the stakeholders referred to in the article and note their position on the proposal. Complete the Download Stakeholders Assignment sheet as assigned. How is your understanding of the film influenced by what you've already said? Whose voices are heard in this film; who's are silent? What is the point of view or bias being expressed? Does the form or style influence the message you take from the film? What techniques are used to persuade you? In terms of the three pillars for sustainable development, what view of the world and what values does the film represent? Answer the following: Consider the issue as you understand it now and the questions you still need answered before you could take a position. 1. Read the Globe and Mail article "Northern Gateway: The Battle is Only Beginning" (May 31st, 2014). If the link to the article does not work, try the PDF version: Page 1 Page 2 (right click on the article to rotate clockwise). In your notebook, make 3-5 connections to the previous learning you have obtained during the last three lesson. 2. Read the Globe and Mail article "Why say no to Gateway? Because there are alternatives" (May 26th, 2014). PDF version HERE. In your notebook, record your personal reaction to this article. April 26th CBC Morning Show: Canadian Press reporter Kristy Kirkup explains how Premier Rachel Notley is putting pressure on the prime minister to be more pipeline-friendly.